It isn’t a secret that new outdoor gear generally tends to put a decent dent in your wallet. If you’re looking for affirmation that you just spent your money wisely on a sweet, exciting new piece of solid gear — take it to the trailhead and wait for the questions to come rolling in. I had Crescent Moon’s new Eva All-Foam snowshoes on my feet for about 15 minutes when the stares and the questions began. I answered questions about the snowshoes at the trailhead, on the trail, and while loading and unloading them from car. Everyone wanted to know about the unique, eye-catching design of Crescent Moon’s revolutionary new snowshoe, and rightfully so; they’re pretty damn cool. While most snowshoe designs are centered around an aluminum frame and decking (the portion of the snowshoe that allows you to float on top of snow) typically made of a composite of polyurethane-coated nylon, or vinyl, or a rubbery type of nylon — Crescent Moon’s Evas are made entirely of foam. Two layers of foam are the cornerstone of these snowshoes. A tougher, harder layer on the bottom, and a lighter, more cushiony dual density foam on the top. Foam is also an insulator, and together, the two layers create a comfortable, flexible and lightweight snowshoe that is easy to walk in, or better yet, run in. Pros: These snowshoes are crazy light. A pair of Eva snowshoes weigh in at 3.5 lbs — offering a lightness that is immediately noticeable once you get ’em out on some snowy terrain. Whether I was on a wider section of trail, or a tiny section that required me to literally put one snowshoe in front of the other, my feet never tangled, and I never felt clumsy (well, any more clumsy than I do in every day life). The elimination of the crampon actually helps the Eva snowshoes accomplish a few things: Without the crampon crunching into the snow, trekking through snowpack in the Eva snowshoes created minimal sound, which enables the user to have a more natural experience outdoors. I also noticed that my snowshoes weren’t constantly getting weighed down with snow sneaking through the hole where the crampon lives and collecting on top of the decking. And without a crampon tucked into the bottom, these shoes were easy to maneuver, which make them a great addition to any avid trail runner’s arsenal of winter gear. In lieu of a crampon to create grip on the trail, the Eva’s are designed with multiple cleats and tire-like technology on the bottom of the teardrop design. The Eva’s are also designed to rock and mimic the natural movement of your foot — rocking from heel to toe and springing your leg back into motion and providing a burst of energy into the next step. Between the extra spring-load in my step, and the lightweight design, I found myself breezing along the trail. And while some snowshoes can be intimidating to put on (like, seriously, where do all of those straps connect! ), the Eva All-Foam snowshoes are simple to don. The design features a dedicated place for your toes and an easy-to-use system of two hook and loop straps on the top of your foot, and one on the back. As someone with pretty tiny feet, I’m constantly battling a lengthy back strap that continuously comes loose along the trail. With the Eva snowshoes, this wasn’t a problem. I didn’t have to stop once to adjust the straps on the snowshoes, and it was a simple process to put them on and take them off at the end of my hike. 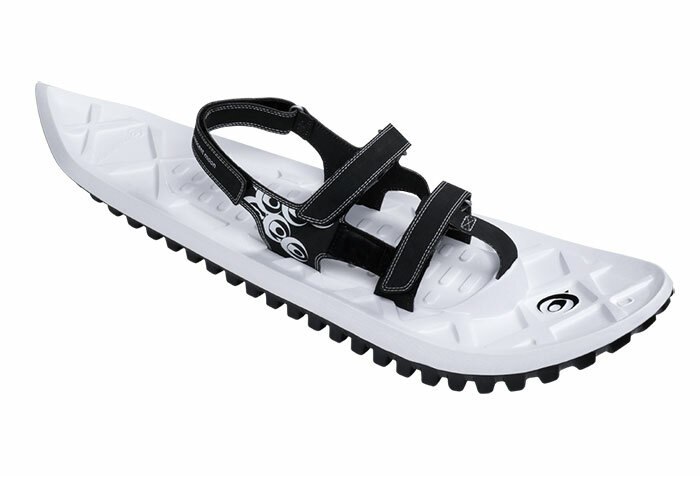 The price point on the Eva snowshoe is also a major a plus. At just $159.95, these shoes fall in under the average price of a good pair of snowshoes, which combined with the ease of use they offer, make them a good option for beginners to snowshoeing. Cons: While the Eva All-Foam snowshoes fit a wide range of footwear and shoe sizes, Crescent Moon states that the snowshoes will work best if you’re under 200 lbs, which automatically makes them inaccessible to an entire group of outdoor enthusiasts. The extra spring-load these shoes provide into each step will also take a minute to get used to. It’s pretty aggressive and although it’s great on flat terrain, I found it cumbersome and unnatural on the ascents and descents along the trail. And while the grip on these snowshoes was perfectly fine and didn’t leave much to be desired, I did find myself working harder on steeper uphill sections of the trail than I typically would with the help of a crampon to dig into the snow and help propel me forward. Bottom line: If you’re a beginner to the sport, looking for a pair of snowshoes to keep your trail running training alive in the winter, or just looking for a pair of easy-to-use snowshoes on mellow trails, the Eva All-Foam snowshoes are a great option for you. If you’re looking to crush some steep, rugged terrain — this snowshoe might not be for you. Where We Took It: On snowshoe adventures in Summit County, Colorado.